John Wheatley College and Glasgow City Council Libraries are working together to support information and learning services for local people in the new Bridge development at the heart of Easterhouse, a formerly very deprived area of Glasgow. 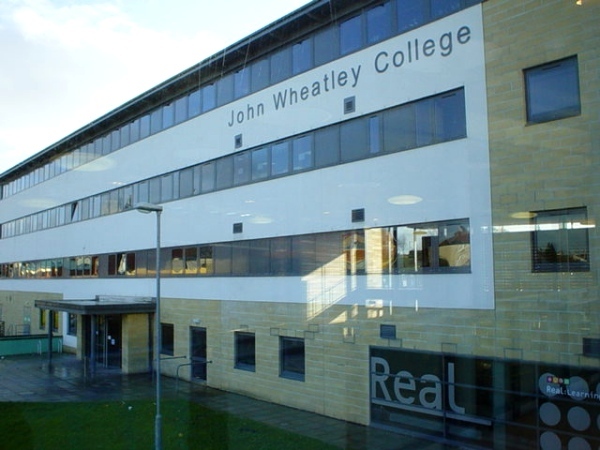 Statistics give some idea of the background of people living in one of the areas served by John Wheatley College of Further Education where: 71 % above the national norm of school leavers have no formal qualifications; 84 % above the national norm are unemployed; 70.8 % above the national norm suffer from long-term sickness and ill-health; the average household income is 26 % below national norm; 165 % above national norm claim income support; car ownership is only 82 % of the national level. The number of single-parent families is 66.7 % above the national norm. In the new Bridge facilities you can sit and read, use the café, borrow books and DVDs or get high speed internet access. Public library users and college students are able to take advantage of the Glasgow City Libraries new REAL learning centre and also of the College´s flexible learning services. The government is keen to promote joint use of libraries and other shared-use buildings. The Bridge Cultural Campus contains a new public library which includes the college library and flexible learning unit, a new Arts Centre with a 250 seat auditorium, modernised leisure and sports facilities, dance studio, café, recording studio facilities. The new National Theatre of Scotland is based here. For library services the partnership breaks new ground and poses new problems. A monitoring project is being supported by the Scottish Library and Information Council (SLIC). This will test and evaluate the scope of the service level agreement to produce a model for adoption elsewhere and will report in September 2007. This joint use model promotes the library strategically as a focus for community learning activities. The library design uses a coffee shop, chill out seating areas, children’s play areas and facilities for self-issue to create a welcoming ambience. For delivery the service is managed jointly, under a service level agreement, by the Glasgow City Council in partnership with the College. College Library staff were transferred to the employ of the City Council and the College buys back library services for its students. Advantages apparent from the opening in autumn 2006 are: greater access to professional library support, purchasing economies of scale, increased footfall and activity, enhanced library related activities, more flexible opening hours, meeting spaces and an informal café environment. On entering the library you are immediately aware of a number of activities in different areas; whether it is a book discussion group for adults or a poetry competition for children. The stock is invitingly well displayed. Publications from Glasgow City Libraries and John Wheatley College are available for sale.